View of the Pedernal from Ghost Ranch. Consequently, my recent visits to Ghost Ranch have caused me to further expand on the impressions from my initial visit, which I reflected on in my blog entry from September twenty-second. I previously was fascinated with O’Keeffe’s blending of abstraction and realism to capture the simultaneously present beauty and brutality of the landscape of northern New Mexico. The artist’s paradoxically seamless presentation of these qualities can cause the scenery in her work to appear quite surreal. O’Keeffe exhibits the unique essences of the landforms in her paintings, but until now, I thought of the somewhat otherworldly appearance of the land around Ghost Ranch which O’Keeffe creates simply as a result of creative abstraction. However, after spending many hours exploring the area, I concluded that there is a much more literal visual connection between the landforms of Ghost Ranch and places beyond the terrestrial realm of Earth. This conclusion came as I walked among the hills and mesas surrounding Ghost Ranch last week, and I observed the severe red and orange colors that characterize these geological features. I had the odd realization that many of them would not look out of place in a photograph sent from NASA’s Curiosity Mars rover. The more I explored the area, the more apparent the similarities between the reddish, rocky landscape surrounding Ghost Ranch and the terrain of Mars became, and O’Keeffe’s abstract and unearthly visual treatment of the scenery in her paintings can indeed make her landscapes appear extraterrestrial at times. Consider O’Keeffe’s 1937 painting Red Hills, Grey Sky. The scene O’Keeffe presents is clearly inspired by the scorched red and orange hills that surround the Ghost Ranch house, but one can just as easily picture these formations occupying the surface of the Red Planet, their shadows cast in the sun’s ultraviolet radiant light that goes unabated by the planet’s meager atmosphere. Georgia O’Keeffe, Red Hills, Grey Sky, 1937. A land formation at Ghost Ranch similar to the one depicted in O’Keeffe’s painting is pictured below. Now consider the similarities in shape and color that exist between this formation and those in the following photograph, which was captured in 2013 by the Curiosity rover at the base of Mars’s Aeolis Mons. Red Hills at Ghost Ranch. O’Keeffe ‘s paintings of the Ghost Ranch landscape emphasize the unique shapes and colors of the area’s landforms, which are highlighted through her use of line and shadow. As a result, the artist exaggerates and abstracts some characteristics of the scenery, making the landscape appear as if it may exist outside the literal, concrete constraints of earthly reality. This quality makes a comparison of O’Keeffe’s somewhat unearthly landscapes and photos of the martian surface quite poignant. 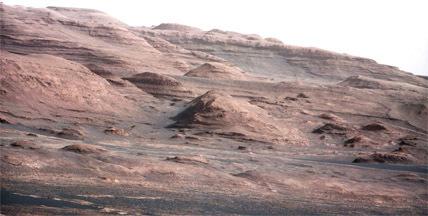 I personally doubt that she sought to portray the Ghost Ranch region in such a way that is visually reminiscent of Mars, especially since the surface of Mars was not closely observed by humanity until the first surface photos of the planet were transmitted back to Earth by the Voyager 1 rover in the mid-1970s. However, O’Keeffe’s taking on of such a unique landscape at Ghost Ranch as an inspiration for her art, and also her making of her home in that landscape, are both testaments to her constant seeking of fulfillment in the “Faraway,” or O’Keeffe’s term for a place of tranquility and inspiration that exists outside of one’s mundane, everyday existence. O’Keeffe aptly chose New Mexico as a personal portal to this place, becoming enchanted by an area of land that, unknown to her at the time, strikingly resembles the landscape of a world that is millions of miles away. I believe that O’Keeffe’s desire to seek the “Faraway” was a major motivation behind her extensive traveling, which lead her to places like Japan, Hawaii, South America, and to New Mexico, where she ultimately made her home. Though she did not know it at the time, she found sanctuary in a place that is visually evocative of the martian landscape, which is not of this world, and therefore a very literal “Faraway.” The coincidental visual similarity between O’Keeffe’s beloved Ghost Ranch and the distant hills of Mars, where no human has ever stood, illustrates how remarkable the appearance of the former is and why O’Keeffe regarded it so highly as a source of inspiration. ← Wait. There’s a CHURRO in this ice cream sandwich? ?